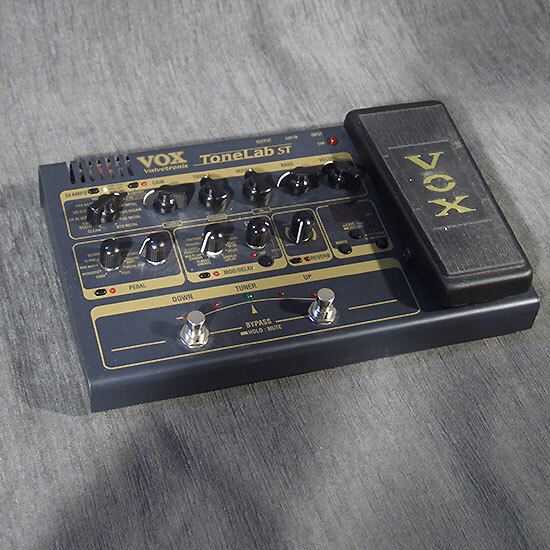 Tonelab ST, Guitar Amp Simulation Pedal from Vox in the Tonelab series. The Vox Tonelab ST is a multi-effects unit containing just about every type of guitar effect out there. It's got 1/4" connections for input and output and also has a built in tuner. The pedal has a tube inside of it, so the effects are at least running on some real power here. It isn't rack mountable since it is a foot pedal station. Since I haven't got an extensive amount of experience with the Vox Tonelab ST, I've yet to explore all of the ends that this pedal has to offer. This is to say, there is a lot that this unit has to offer, a lot of which will take you some time to dive into. Having said this, getting your basic tones from all the effects in here isn't hard at all and overall I don't think that you need a manual. The level of sound quality from the Vox Tonelab ST varies from effect to effect in my opinion. I like some of the effects a great deal, but at the same time many of them are sort of unrealistic sounding. Don't get me wrong, it is certainly nice to have access to all of these different effects in one box, but there isn't enough controlling options for some of the sounds on here. One of the things that there is plenty of control over is your amp modeling selection, as there are 33 to choose from here. The overdrive and gain effects are the ones on here that I enjoy a great deal, as well as the reverb, but the modulation effects are certainly a bit lack luster. First, let me say that in general I'm not an advocate for most of the multi-effects pedals out there. While the Vox Tonelab ST is powerful in its versatility, I still think that if you're serious about getting some good sounding effects that you're better off getting individual effects. Having brought this up, I will say that this is the perfect type of unit for someone looking to get into using effects but doesn't know where to start. It will put you on the right track to see what you like and what you don't, but I can't say I'd recommend it for a professional or for someone looking to get a professional sounding palette of guitar effects. With multiple effects as usual in ToneLab a priority to crunch sounds and saturs many possible combinations 11 amps of 3 possibilities plus a multitude of firms (speakers) it makes much all this is it ... lose some! the famous lamp is present on this little pedalier always fulfilled its role. USB connectivity allows you to manage the effects thanks to VOX Librairian brilliant Software !!! Simple configuration see basic !!! The effects are good. 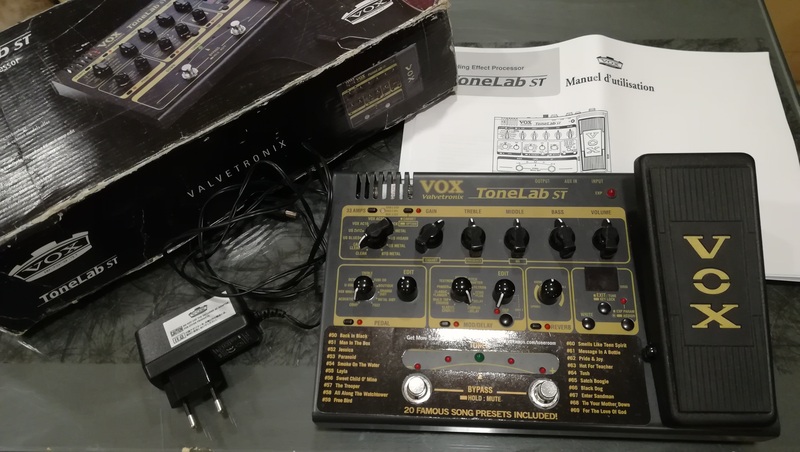 I use it for too short a time to have tried everything but it's VOX TONELAB of the series. I use all this with a marschall MG 100DFX great little amp (despite what some may say) and an Ibanez AS 73 to the hair !!! I use it for one week !!! AC is short for a tour of the beast! I like the compact and solid side of the machine with a sleek look and a bit classieu! Zztop02's review (This content has been automatically translated from French)" top notch"
easy I advise beginners and even less .. beginners manual in front of the first days and the rest goes alone. connected directly to the console, I'm satisfied ..
very easy to use and very beautiful sounds. this is my 3rd FX and I immediately adopted. excellent value for money. But I'm here to highlight a problem that I encounter on this product! entries are deleted! without me to do anything at all! I do not think I read that somewhere. This is very unpleasant and I have no explanation, a little bit of cloth once a month for dust and that's it. Product 2 years and I see no greater thing. exception or not? having bought it used I can not act with the guarantee alas. SlapKid's review (This content has been automatically translated from French)" have, I am disappointed!" Digital course, with a lamp in alibi. No adjustment of input level, which requires reprogramming while changing guitar, thank you very much. Moreover to scroll you must press each time, so do not discount go 0-40 in a long press on a button, it is null. About programs, 99 pitches but only 50 for his creations, until then it's okay. on the other hand you are at the 0 and you get a notch for your last personal program and wham you're not at 49 but at 99 Factory (absolutely filthy also, as often). Not good for the price it offered! Connectivity is good, and in the master volume knob, and especially a cursor vfm-line to adapt the general behavior of the gadget by or it will go. It's pretty simple, luminescent buttons are a plus. There is not much to be paid anyway, it is a serious lack of parameters. My korg AX3G is much higher on this side. The manual is good and necessary because the interface is not terrible since we want to setup the pedal, use the noisegate, etc.. It can be used with headphones, but even my akg k240 studio does not make this pumpkin carosse. Forget it then, especially since the thing is not stereo (mono delay, reverb narrow) in real life. I put correct because it can be paid in a hurry and have a clean sound. Here it is more gate, and for short it offers nothing better than AX3G. The effects are ugly and dull, the delay is a horror bland and lack luster reverb-space speed etc.. The section provides overdrive pedal distos-friendly (as the AX3G) that are essential for clean and dynamic saturax. Curiously this module seems to be placed after the amp module because disabling it distos pedals do not sound at all (the sound is almost extinct), I do not see the usefulness and worse it prevents the use of a front ToneLab clean amp just for distos and its effects. Distos: Lamp seems to be an excuse in any case it does not improve the standard sounds (found in green fashion and are available for ages in the products of the brand as the da5-DA15-AX3G ) the contrary she etric quack and adds a lot of breath. 22 additional sounds (orange and red modes) does not therefore have a greater pace I have not pursued the matter. The compressor is too exaggerated and almost unusable (0.5 to 10.0 already flattens any signal), but it does not matter in this on clean sounds lamp produces a beautiful effect of compression (and breath but good). My AX3G is better on all points, especially stereo and is very convenient. Despite the years between these two products sound quality has deteriorated, although ergonomics ptinouvo easier for the basic. Anyway I think the new series of amps + vt is more convincing that ToneLab, while offering very comfortable option pedal 5-6 buttons. And as the 20w has everything, he returns with the pedal not much more expensive than ToneLab. Sorry but for the pub and positioning thingy I expected much better. 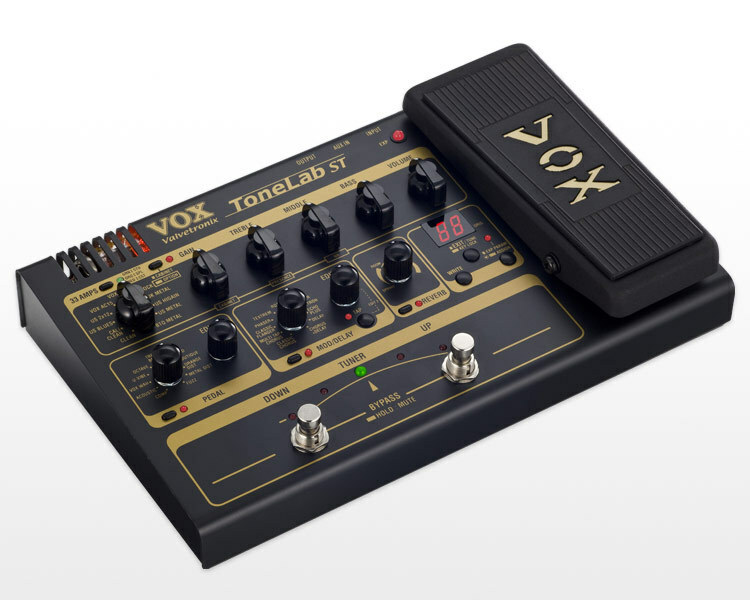 VOX Amplification is offering consumer rebates on its ToneLab ST and ToneLab EX modeling pedals.